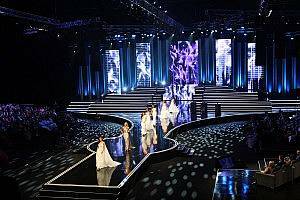 Gavin Wratten, the producer and director from Sic Entertainment has a reputation for creating magic on SA Idols for the past eleven seasons as well as experience for his work on The Face of Africa. “The show concept came about as Gavin talked me through his ideas,” commented Joshua Cutts. “He wanted to go back to a fashion show production. The main stage, with two wide staircases on either, tapered into a long ramp which extended into the centre of the Superbowl. 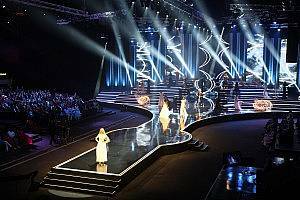 Miss South Africa is usually a banquet affair, but this year Gavin felt the audience should be seated around the ramp, without any distracting tables and the contents thereof. “Gavin has a great TV mind and understands what the viewers need to see and feel,” he adds. A further 12 Robe BMFLs were used as an accent above the main set for strong beams and air effects. “I used 17 Robin LEDWash 800 fixtures to give me a nice soft blanket of colour over the stage and the trusty 16 Robe ColorWash 2500E AT as my main fill light from the front of house truss,” said Joshua. “What I love about them is I can get a nice soft punch with a great colour temperature for television.” He also used 12 ColorSpot 700E ATs for accent lighting above the stage and 24 Robin LEDBeam 100s positioned on trusses in the auditorium to zap around the crowd. For control Johsua worked on a grandMA2 full size, a grandMA2 NPU and a grandMA2 OnPC for back-up. 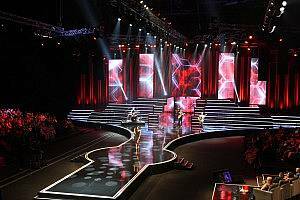 Another main feature was the back of the set, where large format high resolution LED screens ran from Coolux players which Joshua used to add texture and background for sequences as the girls walked. For a lighting designer it’s very important to have a strong relationship with the vision controller, who is responsible for setting all cameras from light levels to colour temperature and overall colour, which is sometimes referred to as shading. 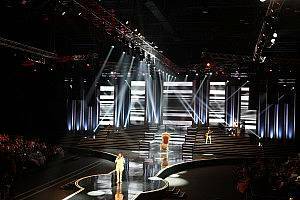 The show, broadcast with a crisp HD image on MNET and Mzanzi, was stunning. Congratulations to Liesl Laurie who was crowned Miss South Africa 2015.